If you don't like texture on your nails, you may like OPI's liquid sand from the Mariah Carey Collection. It was launched for spring 2013. I've seen a lot of nail bloggers' review on this collection and it got me curious. I hope I could share with you all the colors from the entire set but I decided to feature one color -- OPI Can't Let Go Liquid Sand. 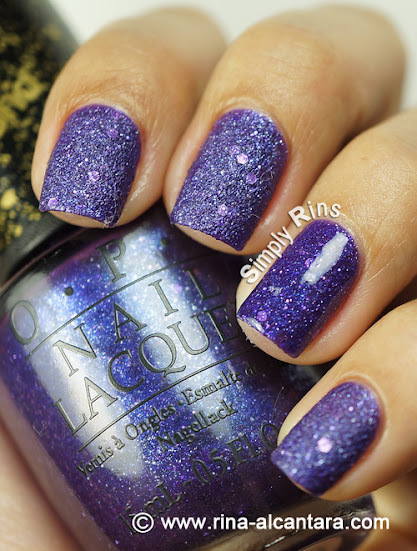 Aside from texture, OPI Liquid Sand line was intended to be worn without top coat and dries glittered matte. For purposes of this review, I wore this as a full manicure and waited an hour before taking photos. I wanted to make sure it was completely dry to see if it holds to its finish promise. 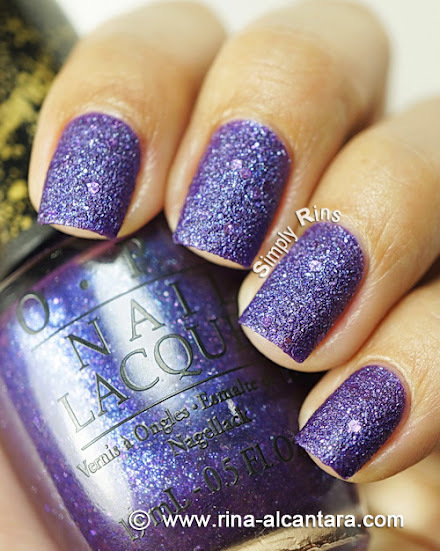 Can't Let Go is a beautiful purple with a few scattered chunky glitters. Formula was excellent and applies easily. Two coats is sufficient but I decided on 3 layers for maximum coverage. I don't personally like texture on my nails but surprisingly, I am comfortable with this liquid sand polish from OPI. It's not one of those that you'd worry about being tangled on your clothes or that would get in a way as you rummage into your bag. Unfortunately, it didn't dry to a full matte. To me, it looked like semi-glossy. Regardless, I liked it! Drying time is satisfactory. It was dry to the touch in approximately 7 minutes. In photo, I applied Seche Vite Fast Drying Top Coat on my ring finger. With top coat, I loved it even more! It transformed to a deep purple and the glitters became more prominent. Gorgeous! Removal is not as hard as removing glittered polishes. This actually came as a surprise. But it was a good surprise! What about you? Have you tried any of OPI's liquid sand polishes? What are your thoughts? *I buy my OPI nail polishes from Digital Traincase. They also carry OPI mini sets aside from other latest polish collections! Very nice Rina. I love purple so I like this a lot. Especially with top coat. Not sure how I would like the texture either. Great swatch! I was so pleasantly surprised by this polish. I bought all 4 liquid sands and this is the only one I've tried so far. I'm usually into the smooth shiny finish on my nails but I loved this polish and the colour! I like how the glitters give it some sparkle so it's just completely matte. Looks so pretty with topcoat also. Liquid Sand definitely looks better with top coat. One of these days I'll get some lol. Lovely color and lovely texture. It looks so special. I would love to have a polish like this one.